Where's the common sense in the GMO discussion? When I wrote an article about Richard Dawkin’s comments on genetically modified organisms (GMO) agriculture, I got a lot of comments on Reddit, Facebook, Twitter, and comments here. One of those sources lead me to an article by one of the world’s top scientists, Nina Fedoroff, a Penn State University faculty member, who actually studies biotechnology, and, more specifically, in the field of transposable elements or “jumping genes,” one of the major beliefs of GMO refusers. Her scientific bonafides are public, including being past President of the American Association for the Advancement of Science (AAAS) and a member of the National Academy of Sciences, probably one of the most prestigious institutions in science. That she is also an alumna of Syracuse University is just a bonus. Dr. Fedoroff recently wrote an article, published in Trends in Genetics, about using “common sense” in looking at the real data and stories regarding genetically modified (GM) foods. Unfortunately, it’s behind a paywall, which will require me to quote liberally from the article, because her points are critical to the scientific and economic data behind using GM foods. The scientific consensus, as I showed previously, that GM crops are safe was established by the vast wealth of data published in high impact factor peer reviewed journals. And I wasn’t even trying to find every article that supported the safety of GM foods (actually I ran out of time). Dr. Federoff pointed the reader to three websites that specifically discuss the scientific research behind GM crops. And no, they’re not all paid off by Big Whomever, one of the most annoying logical fallacies in my book. So what are the facts? Modern genetic methods of crop improvement are responsible for a significant fraction of the recent yield increases in crops where they are used, so farmers who have adopted GM crops have benefitted the most. In 2011, 16.7 million farmers grew biotech crops on almost 400 million acres in 29 countries, 19 of which were developing countries. Importantly, 90% of the farmers growing GM crops were resource-poor small-holder farmers, and they produced almost half of the GM crops grown worldwide in 2011. Between 1996 and 2010, the half of cumulative farm income gain accruing to developing countries was almost US$40 billion. What about the environment? Fact: insect-resistant Bt crops have markedly reduced pesticide use. Approximately 443 million kg less pesticide (active ingredient) was applied to fields between 1996 and 2010 because insectresistant crops were being grown. Less pesticide means more beneficial insects and birds, and less pesticide contamination of water. Fact: herbicide-tolerant crops have made big strides in reducing topsoil loss and improving soil quality. No-till farming keeps the soil on the land and the organic matter and water in the soil. It also reduces CO2 emissions from tillage: in 2010 alone, this reduction was equivalent to taking 9 million cars off the road. Fact: after 16 years of commercial cultivation on a cumulative GM crop acreage of more than 3 billion, there is no evidence that GM food is bad for humans or for animals (pdf). Fact: there is ample evidence that GM corn has lower levels of highly toxic contaminating fungal toxins compared with either conventional or organic corn. Why would any environmentalist or champion of sustainable farming oppose such progress? Why the anti-GM hysteria? I think that the reasons are in the human psyche: negative stories, both true and apocryphal, attract media attention, go viral rapidly, and stick in one’s mind. Once formed, beliefs edged with fear are extremely hard to dispel with mere facts. For example, the widely believed myth about Monsanto ‘terminator seeds’ stirs fear, but the reality is that this was a good idea about how to minimize GM seed dispersal. In the end, it never got off paper because it got a bad label and really bad press. Another is the GM-cornpollen- kills-Monarch-butterflies story, which attracted front-page attention in 1999 and prompted a multi-state study whose results were published in six back-to-back papers in PNAS in October of 2001. The papers got little attention, of course, in a world reeling from the 9/11 attacks. However, their conclusion was that, in the worst-case scenario, less than 1 in 2000 larvae might be affected by Bt pollen. Then there is the myth that GM crops are untested. The EU alone has invested more than s300 million in GM organism (GMO) biosafety research. 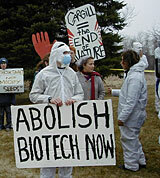 Quoting from its recent report (pdf): ‘The main conclusion to be drawn from the efforts of more than 130 research projects, covering a period of more than 25 years of research and involving more than 500 independent research groups, is that biotechnology, and in particular GMOs, are not per se more risky than e.g. conventional plant breeding technologies.’ Every credible scientific body that has examined the evidence has come to the same conclusion. In the USA, each newly modified crop must be shown to be equivalent to the original crop and the products encoded by the added genes must be independently tested for toxicity and allergenicity, making GM crops the most extensively tested crops ever introduced into the human food supply. Let me sum this up. When you look behind the curtain of the GMO refusers, what you find is nothing. Every myth pushed by the GM refusers is easily refuted with real scientific evidence. And once again I am appalled at how closely the arguments used by the GM refusers closely parallels the arguments used by global warming deniers–and though I have no data, my guess is that GMO refusers completely accept the scientific fact of anthropogenic global warming. Yet they use the same kind of scientific denialism we see from the global warming deniers. The tragedy is that the widespread public hostility to GM crops, effectively fueled by advocacy organizations, has promoted the development of ever more complex regulations and, in many countries, completely blocked GM crop introduction. Today, there are almost no GM crops other than cotton, corn, canola, and soybeans. These are commodity crops, either non-food or primarily animal feed crops, and all were developed by big biotech companies because they are the only organizations that can afford to bring GM crops to market. Even the long-awaited Golden Rice is not yet available to farmers; although it has been ready to distribute for almost a decade, it continues to be trapped in regulatory purgatory. Figuring out how to achieve broader public acceptance of GMOs and relax the regulatory stranglehold is a difficult problem, but it is a social and political problem. The science is quite clear. (Emphasis added). Golden Rice is a GM rice that was engineered to produce beta-carotene, a natural precursor of vitamin A, in the edible part of the rice. Vitamin A deficiency kills over 600,000 children a year. In other words, this great food, which will save lives, is being blocked by regulatory agencies that are listening to elitist, nonscientific, information about the food. This is incredibly sad, no different than listening to anti-vaccination groups forsake vaccinations to put their children at risk. It is long past time to relieve the regulatory burden on GM crops: the scientific evidence is in. They should be regulated based on their characteristics, not on the method by which they were modified. This was the original intent of the US Office of Science and Technology Policy committee that generated the Coordinated Framework for the Regulation of Biotechnology during the 1980s, still the guiding framework for GM regulation in the USA . The three regulatory agencies need to develop coordinately a single set of requirements that focuses on the hazards presented by novel traits, not the method by which they were introduced. They need to accelerate the process, so that it takes months, not years, to get regulatory approval for a new crop modification. Above all, they need to stop regulating modifications for which there is no scientifically credible evidence of harm. And that is the most frustrating part of the whole “GMO’s are scary”–the scientific evidence is strongly in support of the safety, to both health and the environment, of GM foods. It’s kind of like global warming–the evidence is there. Too often, I read memes and claims about GMO’s that are plainly wrong, unscientific, and scaremongering. Time to use common sense, and look at the science. Smart people know that it’s safe. Why do we ignore them? Black RE, Allen LH, Bhutta ZA, Caulfield LE, de Onis M, Ezzati M, Mathers C, Rivera J; Maternal and Child Undernutrition Study Group. Maternal and child undernutrition: global and regional exposures and health consequences. Lancet. 2008 Jan 19;371(9608):243-60. doi: 10.1016/S0140-6736(07)61690-0. Review. PubMed PMID: 18207566. Impact factor: 39.060. Brookes G, Barfoot P. The income and production effects of biotech crops globally 1996-2010. GM Crops Food. 2012 Oct-Dec;3(4):265-72. doi: 10.4161/gmcr.20097. Epub 2012 Jul 3. PubMed PMID: 22750951. Impact factor: (new journal, none as of today). Edgerton MD. Increasing crop productivity to meet global needs for feed, food, and fuel. Plant Physiol. 2009 Jan;149(1):7-13. doi: 10.1104/pp.108.130195. Review. PubMed PMID: 19126690; PubMed Central PMCID: PMC2613695. Impact factor: 6.555. Fedoroff NV. Will common sense prevail? Trends Genet. 2013 Apr;29(4):188-9. doi: 10.1016/j.tig.2012.09.002. Epub 2012 Oct 12. PubMed PMID: 23069214. Impact factor: 9.772. Sears MK, Hellmich RL, Stanley-Horn DE, Oberhauser KS, Pleasants JM, Mattila HR, Siegfried BD, Dively GP. Impact of Bt corn pollen on monarch butterfly populations: a risk assessment. Proc Natl Acad Sci U S A. 2001 Oct 9;98(21):11937-42. Epub 2001 Sep 14. PubMed PMID: 11559842; PubMed Central PMCID: PMC59819. Impact factor: 9.737.